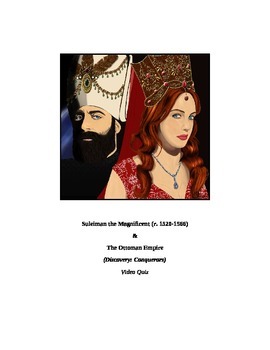 This is a 16 question video quiz consisting of True/False and Multiple Choice questions that follow (in order) information presented in the 50 minute Discovery Conquerors video entitled, "Suleiman the Magnificent" of the Ottoman Empire. The video quiz consists of a cover page, student quiz, and teacher key. The link to this video found on YouTube is also included. This quiz has been created to be completed as the video is being viewed (which may then be graded if desired). I would not advise having students complete this after viewing the video (unless they take really good notes) because I am doubtful that students will remember all of the details included in this quiz.